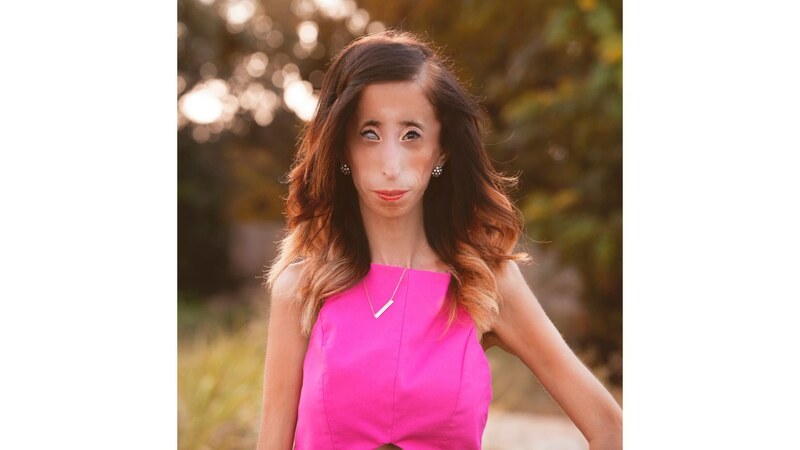 Lizzie Velasquez was born in Austin, Texas, with neonatal progeroid syndrome, a rare genetic disease that affects her heart, eyes and bones, and prevents her from gaining weight. When she was 17, Velasquez faced an onslaught of cyber-bullying, as strangers on YouTube labeled her the “Ugliest Woman in the World.” Comments were cruel: “Why did your parents keep you?”and “Kill it with fire.”But today, at 26 and only 63 pounds, Velasquez stands strong as an anti-bullying activist. A documentary on her life and work, “A Brave Heart,” premieres Sept. 25. She has also partnered with Tumblr to promote “Post It Forward,”a campaign to promote positivity in online communities and a platform that addresses the mental and emotional health of young people. Velasquez tells TODAY her story of faith, self-respect and courage. Honestly, I had no idea I was different from other kids until I started kindergarten. To my family, I was just Lizzie. It was a big slap of reality for a 5-year-old. The other kids were scared of me, pointing at me, not wanting to sit with me. I couldn’t process it. I wasn’t doing anything to them, so why was it happening to me? And I didn’t dare tell anyone. But in high school, things started to get better. I realized I had power over my own life - to be positive. I decided to be brave and join activities and make friends and learn how to be outgoing. It was scary, but I knew it would pay off. I was staff writer for the school newspaper and took photos for the yearbook. I tried out for cheerleading. The uniforms were really cute and every time I wore it around the school, I felt like a superhero. I was more myself around my peers, the version of myself around my family. I felt like someone was putting a fist through the computer screen and physically punching me. I bawled my eyes out. I have no idea who the person was who called me the “ugliest woman in the world.” I don’t know if it’s a man or a woman. I wish I did. I would send a thank you card and flowers because that video changed my life for the better. I didn’t want to retaliate — it was a waste of time. I just wanted to prove them wrong. I realized I could use it for the greater good. I went to college, became a motivational speaker and wrote a book. In 2013, I did a TEDx talk in Austin. Until then I had sort of a following online but this was completely different - it went viral. Sara Hirsh Bordo, who produced the TedWomen event, invited me to lunch to discuss all of the exciting things happening as well as getting to know each other more. She called me a few days later saying she felt like her purpose was to help shine a light on my story by doing a documentary on my life. TEDx: How do you define yourself? I told her I didn’t want the documentary to be just another longer version of my TED talk and I don’t want it to be just about me. That was important to me. When you see the film, it is my story, but it’s also everyone’s story. People can relate to being bullied or feeling insecure or being embarrassed by their looks. I also had the opportunity to work in the film with Tina Meier, the mother of Megan Meier [who hanged herself in 2006 after being bullied on MySpace]. I felt like I carried a piece of Megan with me everywhere. We talked about the fact that unfortunately bullying will never end — ever. It’s a big reminder that there is work to do to ensure others do not feel alone. We have to show them there is light at the end of the tunnel. Recently, I joined the Tumblr team and their campaign, “Post It Forward,” which is so in line with everything I stand for: Take the high road and show compassion for others; encourage others to share their stories and remind them they are not alone. It’s a hub for users to feel safe enough to post what they are personally dealing with. I am honored to partner with them — their heart is in the right place. Recently I did a video explaining what I have gone through. I know exactly what it is like to be attacked online and to feel at risk of letting negatives define you. It might seem like I am having an incredible life, but I still have bad days. I am still processing the fact that I have a final diagnosis on my health. I have a weak immune system and if I am on the go for weeks straight and don’t have a full day to recover, it hits me pretty hard. The doctors say I have to take care of myself first to help others. The most frequent question I am asked is how do I stay so positive. I always tell people I allow myself sad days to be alone and close the blinds and listen to sad music like Adele and cry, eat junk food and have a pity party. I let it out of my system for one day, but the sun comes out the next day I have the power to go on. I want to remind people that at the end of the day, yes, I am an inspiration and motivation for people, but I am human. It’s OK to show your vulnerable side and people won’t see you as weak. Awful things happened to me, but I am still here smiling and happy. I am so grateful that what I have been through has given me the opportunity to be a voice for so many people.